» What is SSO and How Can It Work for My Company? Your employees/team members don't need to remember a unique login for your SourceAudio site -- they login with the credentials they're already using to access their company email etc. on a daily basis. You control your team members' access via your own internal systems so that when new users are added or accounts are deactivated those accounts are instantly enabled/disabled on your SourceAudio site as well. SourceAudio supports a hybrid solution where you can utilize SSO for your own team members while still being able to create individual user accounts via SourceAudio for your clients, partners, agents, freelancers or anyone else who needs access to your site who doesn't have a login for your internal systems. There are many SSO/Shard Authentication configurations available and we currently support what we have found to be the most-widely used: SAML 2.0 and OAuth. 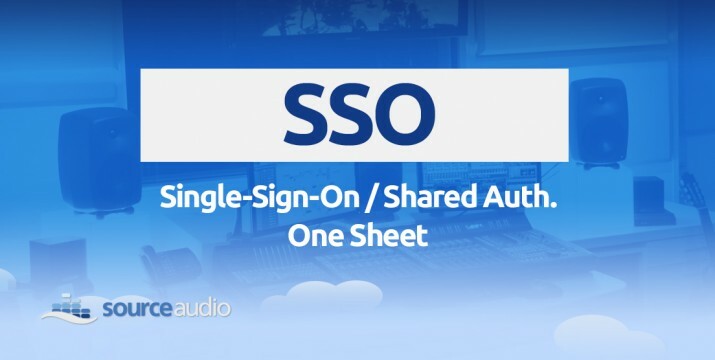 If you utilize another configuration and would like to know if SSO/Shared Auth can work for you please contact your SourceAudio rep, provide any specific details/documentation you have on your SSO configuration, and we will get right back to you with further details on how we can proceed with your specific setup. Getting started is simple. Contact your SourceAudio rep today to let them know you're interested in proceeding with an SSO integration. Please provide your standard SSO documentation with your email so we know which configuration you're using. Once we evaluate your documentation we will get right back to you with a time/cost estimate for completing the project. SAML 2.0 and OAth projects tend to be very quick. Others may take longer depending on the method you're using. All SSO projects fall into our custom work category and because they require dedicated development and support, the dev time is billed at $200 per hour. Feel free to reach out anytime if you have other questions regarding our SSO capabilities! « SourceAudio Detect is Live!